The decision to form the committee is in response to a Jordan Middle School parent’s campaign to change the name of his son’s school because it is named in honor of a leader in the eugenics movement who was also the founding president of Stanford. Jordan Middle School in Palo Alto, as well as all 17 other schools in the district, might soon be renamed. The Palo Alto Unified School District will officially appoint community members to consider renaming all 17 district schools. The school board voted unanimously Tuesday night to create a Citizen’s Advisory Committee to recommend which schools, if any, should be renamed. The renaming committee will be responsible for researching the names of all PAUSD schools, deciding whether school names need to be changed and identifying potential new names. The decision is in response to a Jordan Middle School parent’s campaign to change the name of his son’s school. Jordan Middle is named after David Starr Jordan, a leader in the eugenics movement and supporter of sterilization and racial inequality. Starr was also the found president of Stanford University. Parents from Terman Middle School and Cubberly Community Center have also asked the board for their schools to be renamed as well, as namesakes Lewis Terman and Ellwood Patterson Cubberly were also supporters of eugenics. 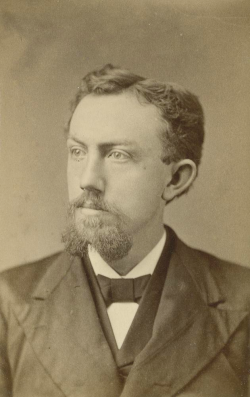 Historic photo of David Starr Jordan. "I think the names should be changed," said Jordan Middle School parent Lars Johnsson, who started a petition to rename the school. "But, I respect and understand that there is a process and there is more time needed to reach out to the community, to look at all opinions and make sure that both students and long term residents and every other constituency has the opportunity to participate." PAUSD spokesperson Jorge Quintana said the board is creating the process to seek committee applications, and will soon decide how many people need to be on the committee. Quintana said the board plans to appoint a committee by the end of March. Board members have expressed a mix of long term Palo Alto residents, current students and parents are ideal for the committee. Once the committee is formed, PAUSD says it will be given a December 2016 deadline to decide which schools need to be renamed.